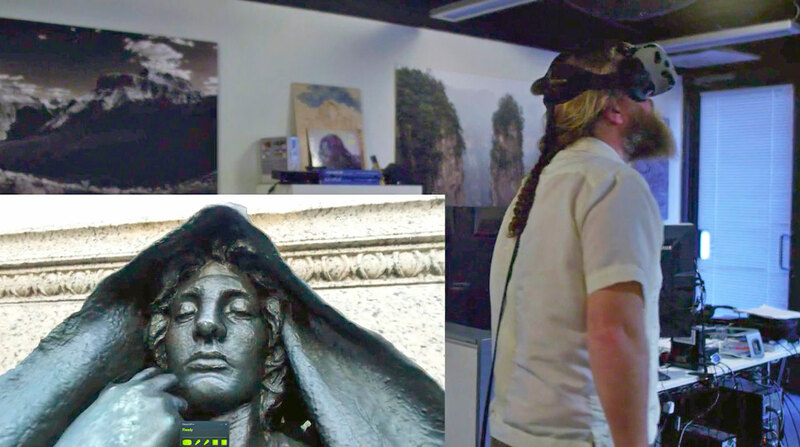 It's a glimpse at how virtual reality can let anyone explore distant museums. Virtual reality and museums are a perfect pair. We've seen plenty of institutions, like the British Museum, dabble in VR over the past few years. But for the most part, the offerings have been fairly basic. The Smithsonian American Art Museum is hoping to go one step further. It teamed up with Intel to develop an experience that takes advantage of room-scale VR's immersiveness to let anyone visit its exhibits from anywhere. While it's only a basic demo at the moment, with just a few rooms and three interactive showpieces, it's an example of how museums can use virtual reality to transform their relationship with the public. The Smithsonian and Intel worked with several VR studios, including V.A.L.I.S., Framestore, xRez and 8i, to recreate one wing of the renowned art museum. Using a combination of laser scanning and photogrammetry (creating 3D models from 2D photographs), they reconstructed the space for VR exploration. Framestore handled the interactivity side of things while Intel provided a powerful Xeon-equipped rig to construct the demo. When I viewed the experience through an Oculus Rift, it wasn't exactly photorealistic. It was more like what you'd expect from an indie video game, slightly unpolished and rough around the edges. Still, it managed to be fairly convincing; it felt like I was standing in a museum, which is ultimately the most pressing goal. I was surrounded by three exhibits: the painting Aurora Borealis by Frederic Edwin Church, the bronze Adams Memorial sculpture by Augustus Saint-Gaudens and a doorway that led to the three-screened video installation Face in the Crowd by Alex Prager. I could see the rest of the museum off in the distance, as well as a nearby room with even more exhibits. The experience was impressive because it was more than just a quick tour. I was able to walk around the space, thanks to room-scale VR, and take a closer look at the pieces. As I approached them, descriptive text appeared, similar to what you'd read on the cards you'd typically find in an exhibit. I could imagine museums doing something similar in the future using augmented reality for actual visitors, so in a way this VR experience is preview of what's to come. The three main pieces featured portals that I jumped into for an even more immersive experience. When I leaped into the painting, I found myself viewing a 360-degree video of the aurora borealis in Iceland. Leaping into the bronze sculpture brought me to a digital recreation of the actual Adams Memorial in Washington, D.C., where I found myself surrounded by trees and birds. Hopping into the Face in the Crowd exhibit placed me in a black room with three walls playing video, just like you'd see in an actual museum. The piece explores moments of quiet contemplation among strangers in large groups, and it was especially moving in VR, where their projected faces seem almost theatrical. When I turned around, I found myself face-to-face with director Alex Prager -- or at least a volumetric 3D version of her -- who offered up her own commentary on the piece. I was able to switch among her audio and the videos simply by looking in different directions. While the Smithsonian's VR experience is clearly just a first step for the museum, it's incredibly promising. Intel reps say the Smithsonian currently doesn't have plans to release this VR tour widely, and it's unclear if the museum will continue to work on it. I hope this experience finds its way to the public somehow -- it's not only a solid VR demo but also a model for other museums to follow.